Take advantage of this free webinar to learn more about (nearly) pain-free transitions to SAP HANA and HANA-based solutions. 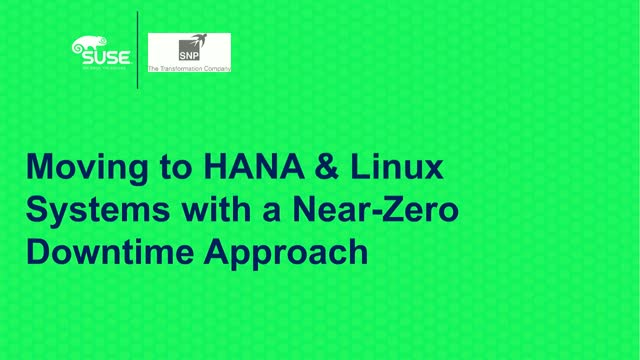 If your enterprise runs the SAP database tier on UNIX today, you’re likely considering SAP HANA on Linux as a next move. Maybe you already have the SAP HANA licenses and are ready to go. SUSE’s Mike Nelson will describe SUSE’s approach to Linux for SAP environments and give an overview of related open source infrastructure solutions from SUSE. SNP’s Davide Bonacina, who, as a hands-on consultant, has been at the epicenter of SAP customer migration projects for several years. SNP has developed a “Bluefield” approach for fast, trouble-free migrations with Near Zero Downtime, which Davide will explain.